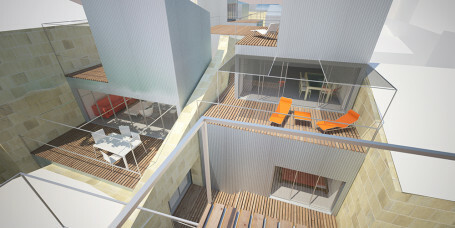 InCité have been constructing residential buildings for the last 50 years in Bordeaux. Several years ago this association started to become very interested in the Bordeaux historical center. To build a town within the town, to rehabilitate buildings constructed in the 18the century one needs to inject that which is needed for contemporary living. 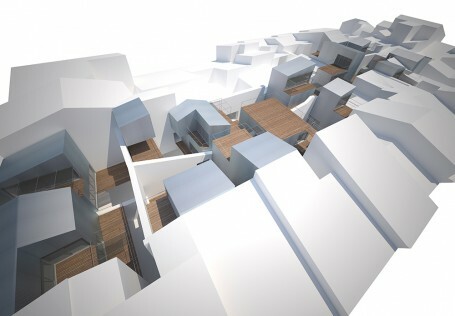 The goal of this project was to maintain a mix in the historic quarter, which little by little has been neglected by certain population groups. To allow the return of families for example one must create big apartments with external spaces have the possibility to park a car or even a bicycle close by, for those elderly lifts need to be provided and for the city itself the notions of sustainable development. Six teams of architects (4 Bordelaise, 1 Portuguese and 1 Belgian), were invited to work on the evolution of 2 urban town blocks in the historic center of Bordeaux.